Chesapeake Bay Christmas....the ornaments that started it all!! These are the first designs produced by Chesapeake Bay Christmas Co...Santas and Snowmen on Crab shells, oysters, sand dollars, seashells and do not forget the Christmas Crab Pot a must have for all mid-Atlantic Christmas trees! 2-4" Hand painted Santa face on oyster shell. Ho! Ho! Ho! each one is unique and different according to the shell he is painted on! 2" to 3" spiral snowman ornament. A unique fishing snowman on a real seashell! 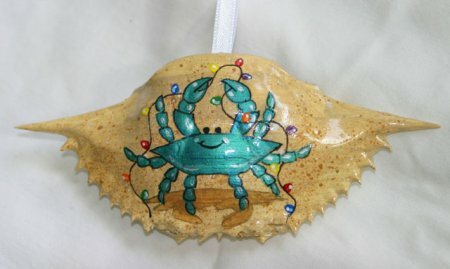 3"-4" crab with Christmas Lights on real Blue Crab shell. One of our best-sellers! 3-4" shell tree made entirely from shells! Looks great on the Christmas Tree! One of our best sellers at the shows!